Ever have those nights when you really don’t feel like cooking? I do, we all do – but instead of reaching for that frozen pizza or calling for take-out, turn to some of my quick and easy meals to help sooth your soul! Tonight was one of those nights in the kitchen for me. We were all hungry, but didn’t feel like making a meal that would take forever, so we opted for a quick pasta dish. 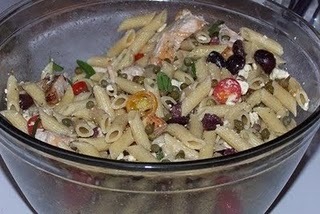 Garden tomatoes and basil, capers, olives…and some grilled chicken breast. Talk about a light and healthy meal and oh so delicious! But, you better hurry out to the market to take advantage of the tomatoes and basil still available….fall is coming on fast. Try this recipe for a weeknight meal- you won’t regret it! Toss everything in a large bowl and serve with toasty french bread!